BEIJING ― Former Samsung Group Chairman Lee Kun-hee will keep his post with the International Olympic Committee despite his prosecution for tax evasion. ``There was mention of his status Wednesday,'' Korean Olympic Committee President Lee Yeon-taek told The Korea Times Thursday. ``There won't be any problem at all with his IOC post," he said, without directly mentioning Lee Kun-hee's name. Lee Yeon-taek held a meeting Wednesday with IOC President Jacques Rogge on the membership status of the former Samsung executive. 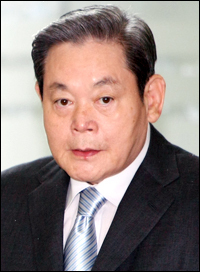 The former tycoon resigned April 21 amid a slush fund scandal. An independent prosecutor is now seeking a prison term of seven years and fines of 350 billion won ($350 million) for him. Lee Yeon-taek said Korea hopes to have at least two IOC members commensurate with Korea's status as the world's tenth-largest country for sports. Rogge said he understood the concern and will consider measures. The KOC chief also thanked the IOC's effort to sponsor a joint march by the two Koreas at the opening ceremony of the Beijing Olympics. The attempt failed, however, as the North refused talks on the matter. Rogge was also invited to a 20-year anniversary celebration for the 1988 Seoul Olympics slated for late September.